Say, you are worried about your mother who seems to not remember what you had just told her. Perhaps your husband has taken the wrong turn a few times on the way to a favorite restaurant. Maybe in conversation you have searched for a word to explain something. You know it is there, but it’s just out of reach. Is this dementia? Alzheimer’s? You are familiar with the signs, but how do you know for sure? Are memory changes typical aging or symptoms of dementia? It is reassuring to know that three-fourths of people over 50 report that their memory is not as good as it once was, and of those who complain about memory problems only 10% have Alzheimer’s or dementia. 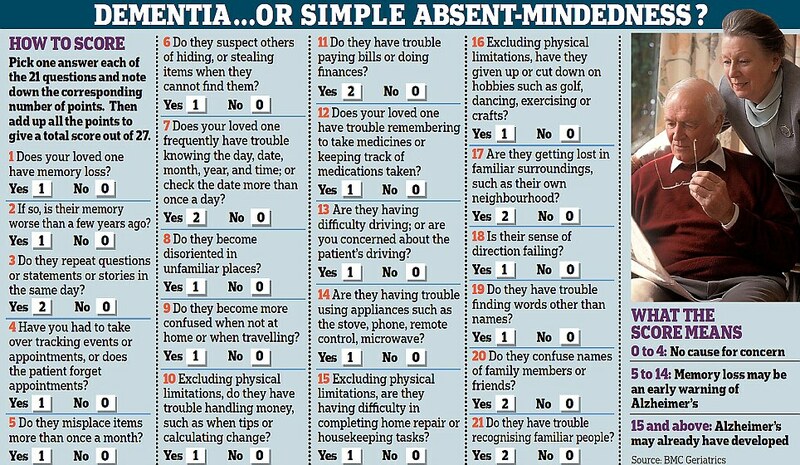 If you have definite concerns there are a few tests or questionnaires that can be helpful in clarifying whether a person may have dementia. Be aware that these cannot be used as diagnostic tools except by a professional. If, after administering the tests you see a problem, you should take the test and the person to a doctor who is able to give you some insight and direction. Have the person draw a clock by hand on a large piece of paper. Have the person draw the face of a clock and put the numbers in the correct positions. Then have them draw the hands to indicate the time like 3:40 – one hand of the clock on 3 and the other on the 8. If the person cannot draw the clock or if it looks abnormal they would fall into the category of “probably” suffering from mild cognitive impairment or dementia. Many people that cannot pass this test might be suffering from some other illness. This is why it is necessary to consult your doctor. First, name three objects and then ask the person being tested to repeat them back to you (for example, chair, house, apple). If the person cannot repeat the three objects after a few tries (cannot learn them), please consult a physician immediately. If the person is successful give them another task for about ten minutes or the clock drawing test. Next, ask the person to repeat the words/objects from the first part of the test. If the person is unable to repeat any of the words, they might be categorized as mildly cognitively impaired or suffering from dementia. NEXT: The diagnostic tools doctors use. This entry was posted in Dementia and tagged Aging parents, alzheimer's, caregiving, Dementia, Memory loss, mental-health, Parenting an Aging Parent, parenting the parent on April 25, 2018 by kathybjork.